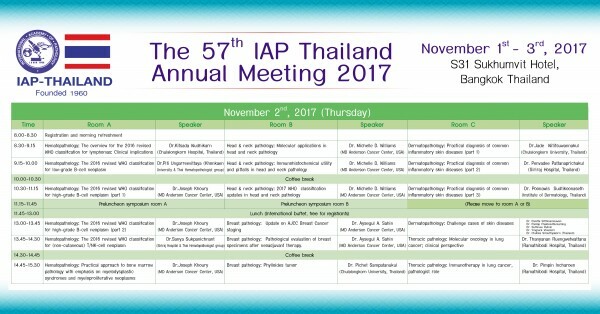 The annual pathology academic meeting organized by IAP-Thailand Association. The meeting is for promoting knowledge for local and international audiences. All academic sessions will be conducted in English language. We are very welcome for all the incoming audiences over the world. The below is the draft for the meeting schedule. There might be minor changes. Please see the registration rate below. 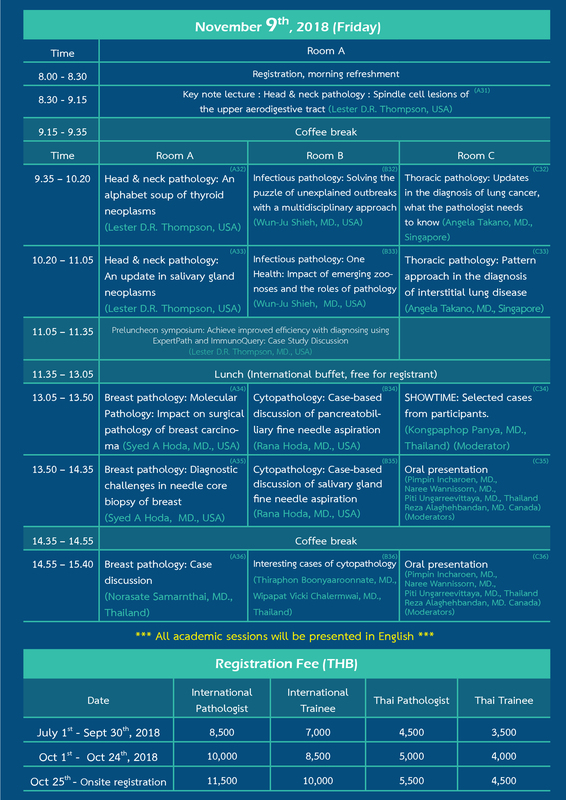 Please note that no one day registration available for pathologists or trainee. The registration fee is depended on the date of payment, not the date of online booking. 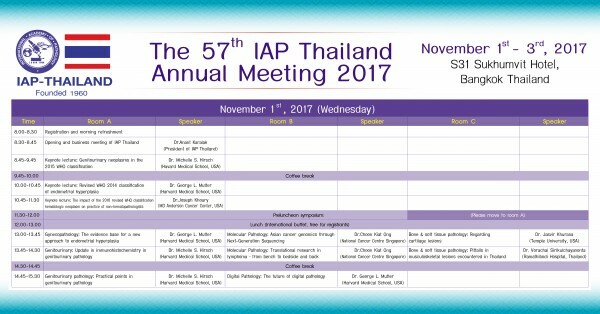 Abstract submission period for the IAP-Thailand Annual Meeting 2017 is extended to September 15th, 2017. The abstracts shall be submitted to presentation@ Alpha88 alpha88.lyonsconsultinginc.com They must be arranged in constructed fashion including title, background, method, results, and conclusion, and must not exceed 250 words. Authors’ name and their affiliations must also be given. The language must be in English. Symbols are allowed to be used. Once submitted the abstract via email, no changes or corrections will be accepted. The author should specify whether the presentation will be performed in oral or poster platform, or could be any. If author is able to present in both oral and poster platforms, the committee will make the decision and notify the author. An email notification for the acceptance will be sent by September 15th, 2017. Presenter must register to the meeting. On the date of submission, the abstract must not have been published elsewhere. Language: Presentations must be conducted in English only. Heading: The poster title, authors’ name and affiliations should be placed at the top of the poster. 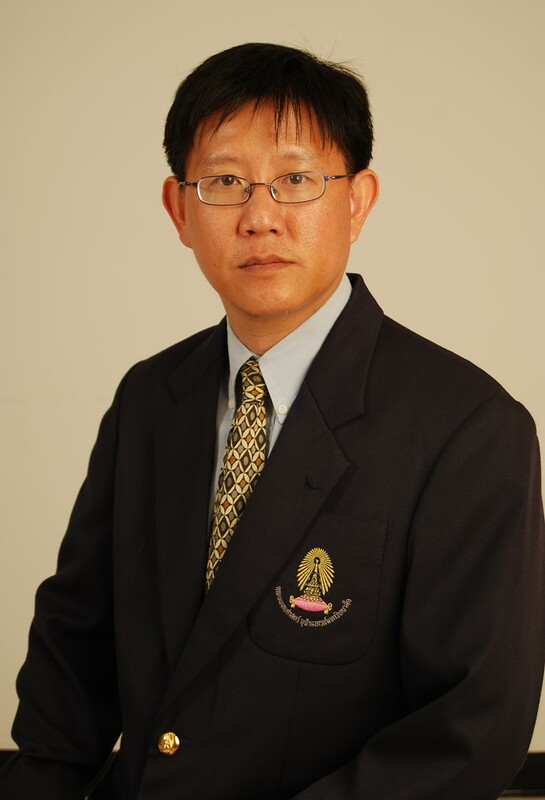 Poster size: 90 cm width x 120 cm height. Presentation period: Posters will be available for viewing from November 1st, 2017 and must be taken down by 15.00 hr. on November 3rd, 2017. Formal poster viewing will take place on November 2nd, 2017 during coffee breaks. 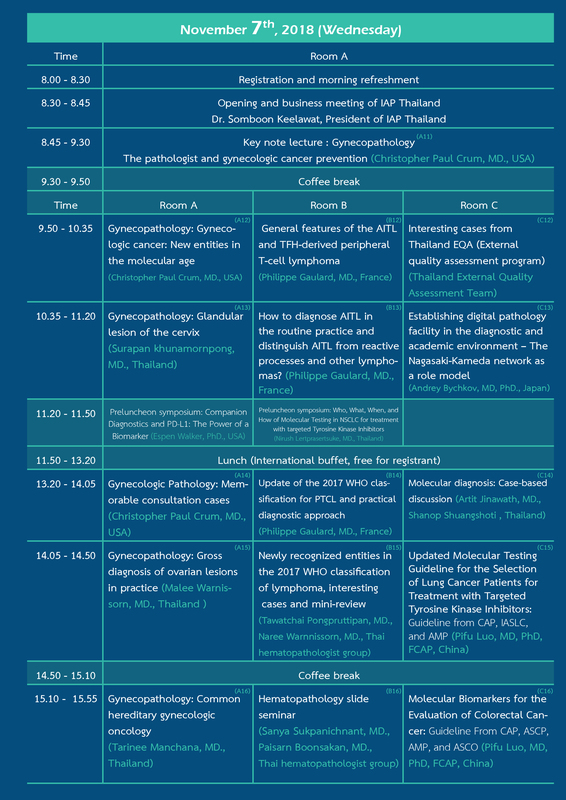 Poster presenters are requested to be available for discussion at their posters during the formal poster session. All delegates are encouraged to attend. 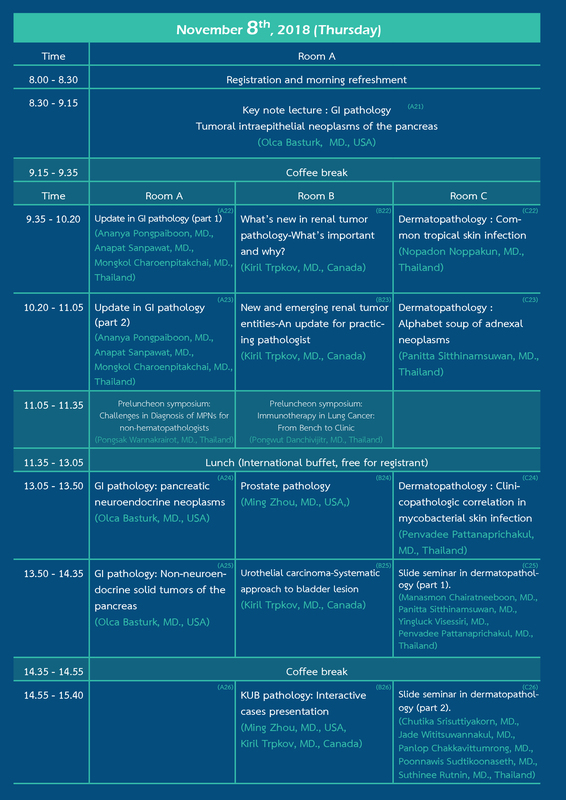 IAP-Thailand will also provide support to pathologists from neighboring countries to attend the meeting. Applicants must be pathologists from CLMV (Cambodia, Laos, Myanmar, and Vietnam) who currently practice pathology in their own countries. Applicants are required to submit either oral or poster presentation to the committee according to the guidelines. One grant for one applicant from each country in CLMV will be allocated with an amount of 5,000 THB/grant. 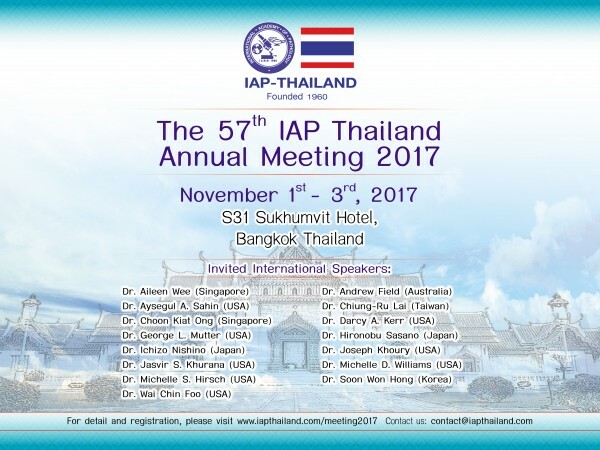 Applicants must never have previously disclaimed the grant from the IAP-Thailand. 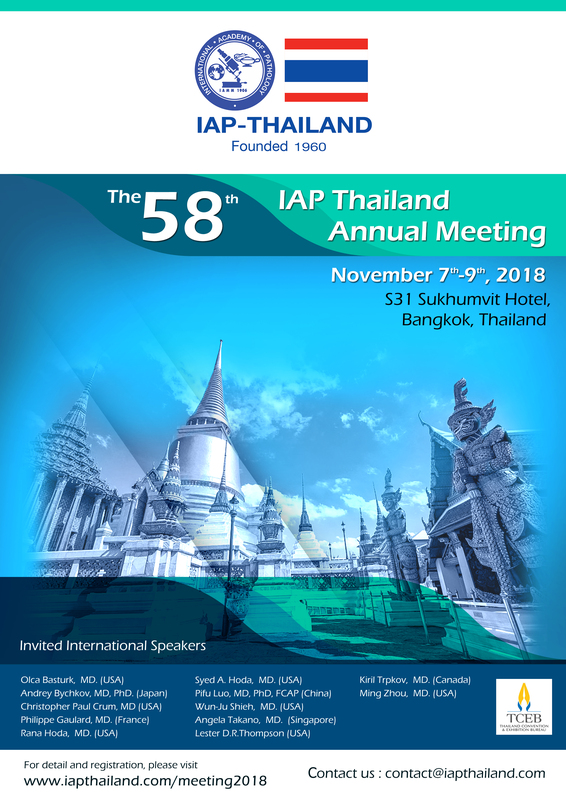 In case there are more than one applicant from each country, the IAP-Thailand committee will make final decision for the most appropriate candidate or consider providing extra-quotas if suitable. Registration fees are waived for those who receive the grants.